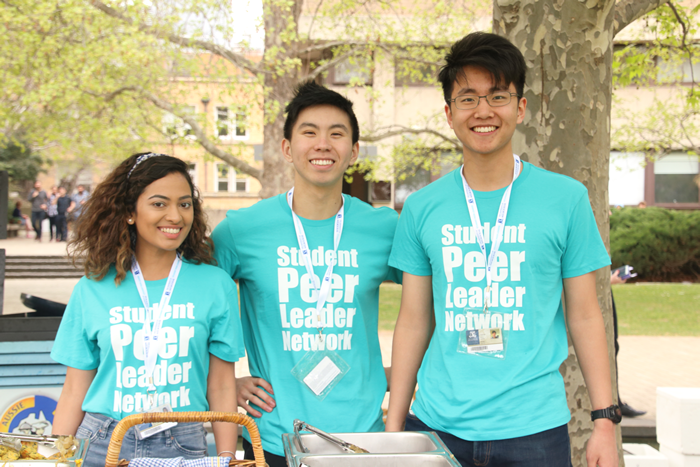 The Student Peer Leader Network is a chance for you to contribute to the University community by co-creating activities that promote connection and belonging among students. Peer Leaders are students who are selected to work on University-led initiatives because they demonstrate a commitment to community values. Peer Leaders work alongside staff to enhance the student experience by delivering events and activities tailored for the student community. Melbourne Talks: A six-week program for students to develop English language skills, learn about Australian culture and make friends. Pitch Perfect: A skills building workshop for students on how to develop their personal pitch. Backstory: A storytelling event based on The Moth. Mock Assessment Centres: Workshops for students to practice various activities & receive feedback. Peer-to-peer drop-in sessions: Weekly sessions where students receive advice on a particular subject. Leadership Day: a celebration of student leadership on campus. Student panel discussions and Q&A style events. Wellbeing activities, including R U OK? Day and Mental Health Week. How can I become a Peer Leader? Recruitment of Peer Leaders usually takes place twice a year - in January/February and June/July - prior to the start of each semester. Check back here around those times, or keep an eye on Careers Online for advertisement of Peer Leader roles. be currently enrolled as a University of Melbourne student (domestic or international) and remain enrolled and be available for a full calendar year. Undergraduate students: You must have completed one year of study. Graduate coursework students: You are eligible from the commencement of study. be able to commit to a minimum of 10 hours per week for the fixed term period (12 months). As part of the University of Melbourne’s commitment to diversity and social inclusion, students who have demonstrated social, educational or financial disadvantage are strongly encouraged to apply. "The Student Peer Leader role was a great experience for me. Being a Peer Leader gave me the opportunity to develop myself personally and professionally. I had the autonomy and responsibility to run my own projects, but always had the support and guidance of staff and other Peer Leaders whenever I needed it. I am now more confident and will take everything I have learned to my future roles." The Student Peer Leader Network Facebook group is a platform for sharing advice on leadership, volunteering and employability. Join now to receive updates and opportunities from the student community.